Your local Level One Bank travels with you, wherever you are. Download our free app to securely manage your business finances, anytime and anywhere, using your mobile device. 2. Once you’ve downloaded the app, login using your existing Business Online Banking username and password. Please note: Please note: If you previously downloaded our mobile banking app from the Amazon App Store, you must download the app again from the Google Play Store or Apple Store to continue receiving important app updates and improvements. Required Disclosure: Must have a Business Online Banking account to enroll. 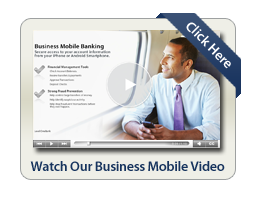 Business Mobile Banking is subject to our Online Terms of Service and Business Online Banking Terms and Conditions. Not all services will be available to all users. Some services within Business Mobile Banking may require prior Bank approval, additional acknowledgement of separate terms of usage and/or (if applicable) acknowledgement of any applicable fees and services charges. Internet data and message rates may apply. Please contact your internet service or mobile phone provider for details on usage charges and limitations. System availability and response times are subject to market conditions and speeds may vary. iPhone is a trademark of Apple, Inc. Android is a trademark of Google, Inc.